In addition to Ilhan Omar’s 2013 arrest and her marriage to her brother, as well as her public comments revealing her hatred for Jews and indifference about the 9/11/01 attacks on America by Islamic jihadists, Omar’s seditious and treasonous actions are what causes the gravest concern to Understanding the Threat (UTT), and should be grave concerns to the American people. 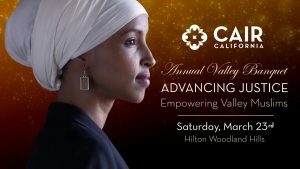 Ilhan Omar works closely with the leader of Hamas in the United States doing business as the Council on American Islamic Relations (CAIR) – Nihad Awad. Hamas was designated a Foreign Terrorist Organization in 1995 by the U.S. government. UTT assesses Nihad Awad is also the General Masul or leader of the U.S. Muslim Brotherhood. 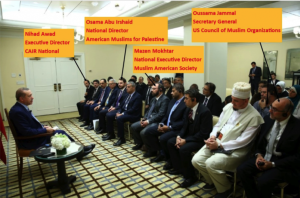 The U.S. Council of Muslim Organizations (USCMO), formed in 2014, is the largest conglomerate of Muslim Brotherhood organizations in the United States. Over the last couple of years, the USCMO has been turning the reigns of power of the Islamic Movement in the U.S. over to the Turkish Muslim Brotherhood, specifically to the likely Caliph of the soon-to-be declared Islamic Caliphate, President Erdogan of Turkey. Now, photos have surfaced of Ilhan Omar meeting with President Erdogan in New York city in 2017 during the same time senior U.S. Muslim Brotherhood leadership via the USCMO was also meeting with the probable next caliph, Erdogan. State Legislator (MN) Ilhan Omar meets with Turkish President and likely future Caliph Erodogan in New York City in 2017. Senior leaders of the U.S. Muslim Brotherhood under the banner of the USCMO meet with Turkish President Erdogan in New York City in 2017. Hamas/CAIR, the USCMO, and Erdogan are all working to establish an Islamic State under sharia. Ilhan Omar is a sharia adherent muslim with a track record of supporting ISIS terrorists, and working against the best interests of America, all while holding public office. Ilhan Omar’s presence in the middle of strategic planning meetings among hostile entities indicates her elevated role in the coming establishment of the caliphate and the war the Islamic Counter-State will wage in the United States. The law and prudence dictates that a real investigation be conducted into Ilhan Omar’s seditious and treasonous activity. The seemingly ineluctable paradox of referring to any sharia adherent Muslim as a “traitor” is clarified in U.S. Supreme Court decision, “Marbury v. Madison”, of 1803: I.e., “any law repugnant to the Constitution is void”. And since all of said frauds are demonstrably mandated under penalty of death to participate in Islam’s 14-century global war* to “destroy Western Civilization by sabotaging its ‘miserable house’ from within”, they shouldn’t even be allowed in the country much less in the U.S. Capitol spouting subversive demands that American citizens be denied their right to freedom of speech, while posturing under the guise of having been duly elected to our Congress in accordance with that body’s solemn oath to protect and defend us from all enemies both foreign & domestic. Nonsense, the purpose of their arrival from day-one has been and continues to be TRAITOROUS, which explains their demand to be sworn in with their hand on a KORAN! *Anyone wishing to own an Arabic-to-English translated verbatim copy of Islam’s declaration of war on the United States — which was seized in 2004 from a subterranean basement in Annandale. Virginia in accordance with a federal search warrant by special agents of the FBI — may do so by simply contacting http://www.securefreedom.org to request (for a nominal handling & postage fee): GOVERNMENT EXHIBIT 003-0085 3:04-CR-240-G U.S. v. HLF et al. I did not know that Omar was a state representative…before winning her Congressional seat she is much like Obama another fast rise, to fulfill the diversity, very popular with all the right attributes for the leftist democrats. She also took her oath of office on a Quran, that for many view it as a religion..,just think it is” fine,” since it is a religion, when the reality is it is a warfare doctrine to conquer land. The larger goal is to bring sharia law..that obligates muslims to wage war of the mind and jihad and gain power in the United States. To accomplish this mission of supplanting the Constitution with sharia law there must be a fog of the mind, the information about the war had to be to suppress repugnant, reality of Islam and call it hate speech, and try to remove the freedoms of the Constitution..Omar’s visit to Turkey to meet with the President Erdogan of Turkey the current head of the caliphate and the muslim brotherhood leaders is a revealing photo and very alarming but it happened. Islam all before with a. is at war with the U.S. and our own national security refused to study the doctrine that proves this problem or maybe flipped sides after successful elections and massive clever deception. So now I understand the un- reality of the hostile efforts to declare white Americans “white racist”, Nazi’s, bigots and islamophobes, in much of the media daily it had to be created and with precision repeated by all democrats and far left. Why did BLM grow so strong, and antifa, and far leftist protests were both considered “our issues ” by CAIR and MB in a meeting of muslim activists. to start a revolution in our country . It had to be the issue, it paved a road of delusional shame or so it seemed to weaken our Constitution that if dissolved would aid the goal to get acceptance and Islam and sharia or socialism to rule and add the U.S. to the Islamic caliphate, and what was done to stop it once the CVE was enacted to hide the issue and bring a world government of sharia. So why was President Trump an issue. he wanted to reduce the threat jihadist and Marxist at the border and reveal the facts and truth. As Ramirez stated who may be the Jackal It would take a cabal of Islamist and Marxist to take down democracy” in the U.S…it is a looming threat now. The secret of the deep state? Can state representatives visit Turkey and a Islamic terrorist group?